Please select option for Champion Youth Baby Bear Tee. 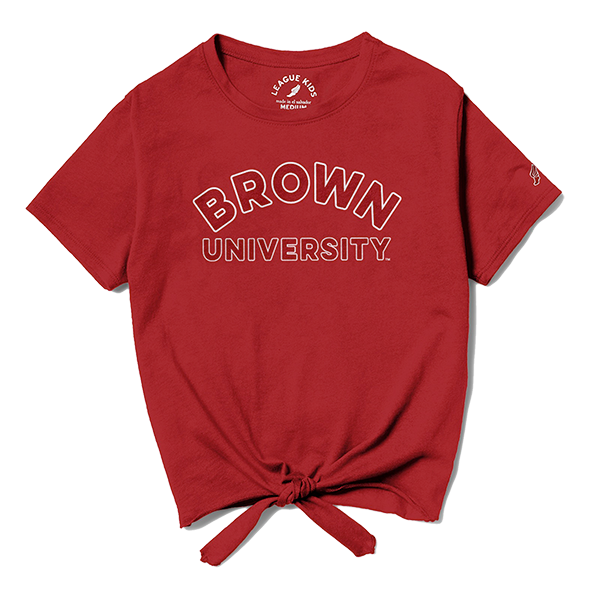 Champion 60% cotton, 40% polyester brown crew youth sweatshirt with black panels on upper arms and ribbed detail at neck, end of sleeves, and bottom. End of sleeves and bottom of sweatshirt have a raw edge. 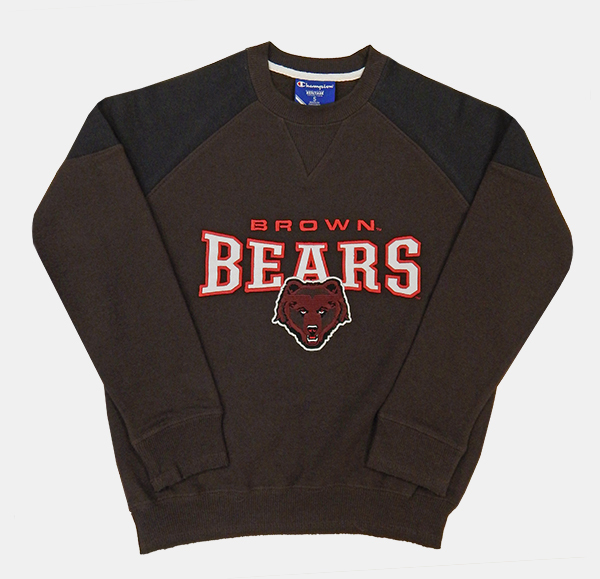 'BROWN' embroidered in cardinal above 'BEARS' in white fabric letters with embroidered cardinal outline above embroidered maroon, brown, cardinal, black, and white Bear patch with white embroidered outline. 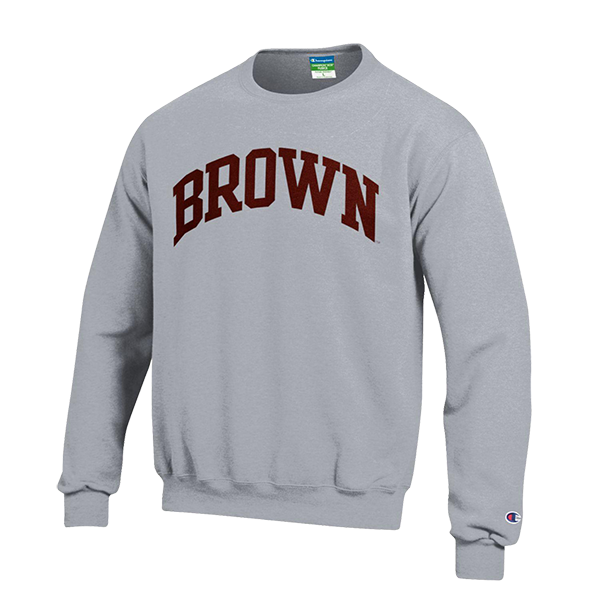 Please select option for Champion Youth Brown Bears Crew Sweatshirt - $46.99. 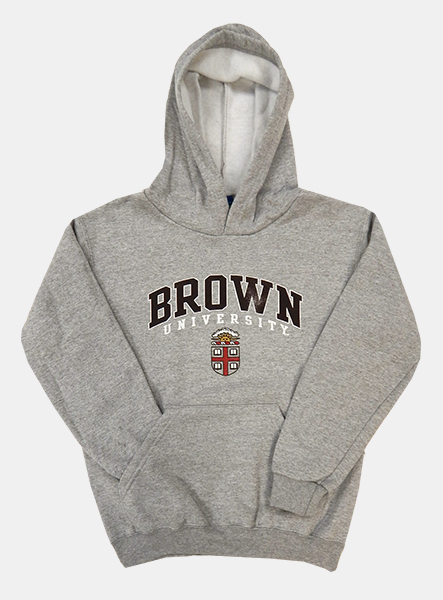 Champion 50% cotton, 50% polyester, grey youth hooded sweatshirt with handwarmer pocket. Distressed imprint of 'BROWN' in brown with white outline above 'UNIVERSITY' in white above cardinal, gold, black, and white Crest. Please Note: Design is supposed to be distressed, please look at the 2nd image, especially the W. The printed design is meant to appear slightly-faded and worn. Please select option for Champion Youth Grey Crest Hooded Sweatshirt - $36.99. 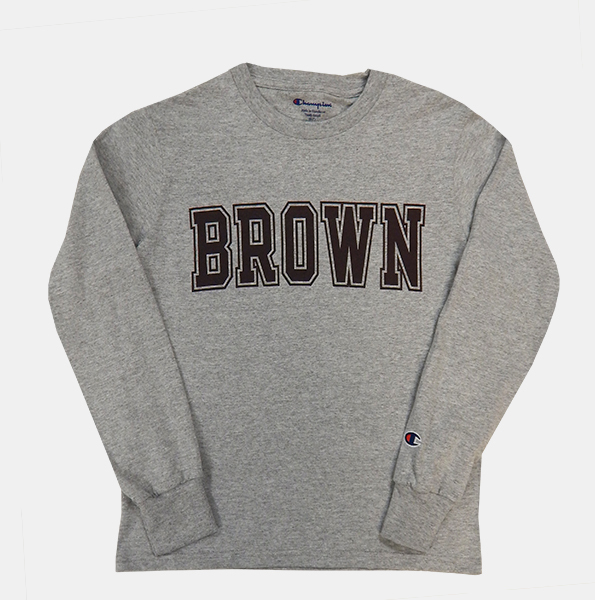 Champion grey long-sleeve practice youth tee with 'BROWN' imprinted in dark brown with dark brown outline. Please select option for Champion Youth Grey Long-Sleeve Practice Tee - $24.99. 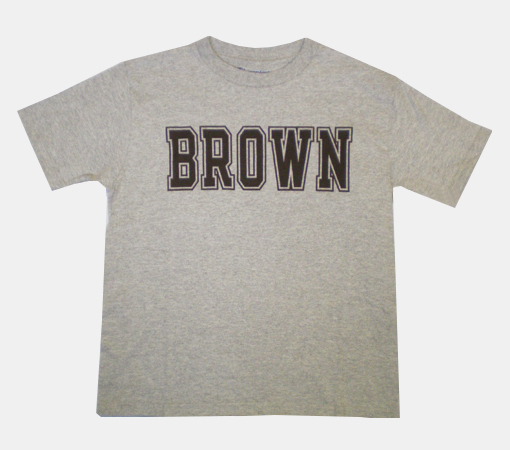 Grey tee with 'BROWN' imprinted in brown lettering. Please select option for Champion Youth Grey Practice Tee - $18.99. Please select option for Champion Youth Powerblend Crew - Gray. 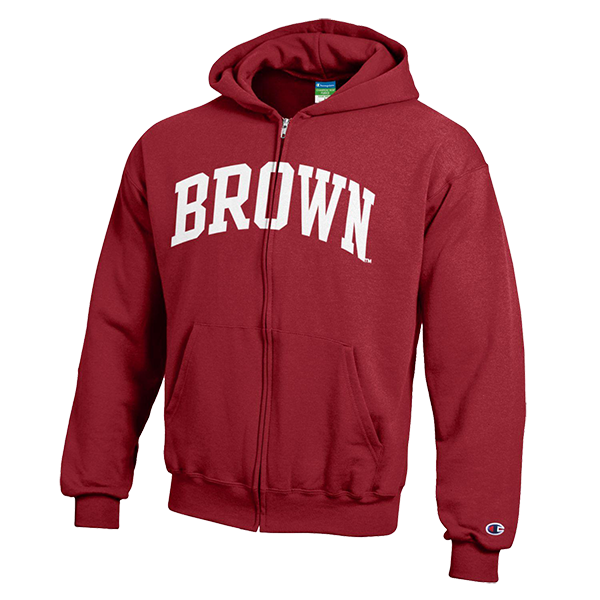 Please select option for Champion Youth Powerblend Full Zip Hoodie - Cardinal. 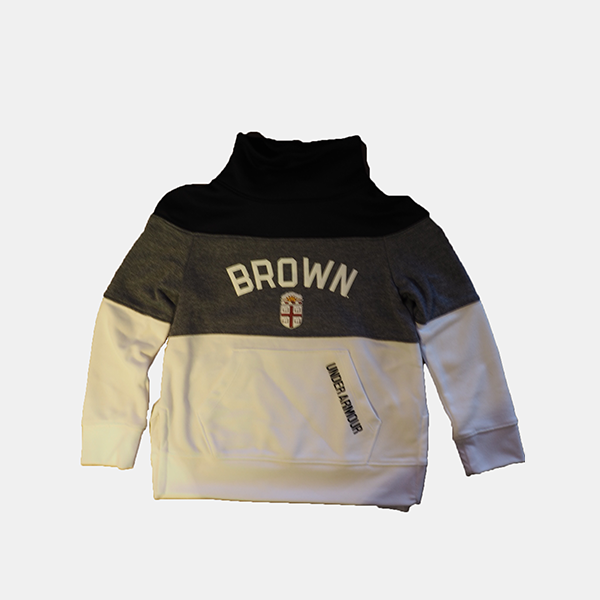 Please select option for Champion Youth Powerblend Pullover Hoodie - Gray. Please select option for League Girls Tie Front Tee - Vintage Red. 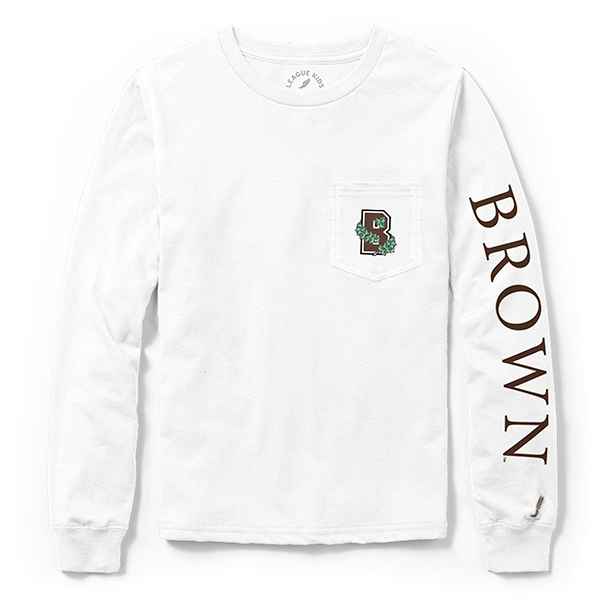 Please select option for League Youth Long Sleeve Pocket Tee - White. Please select option for Under Armour Boys Armour Fleece Hoodie. 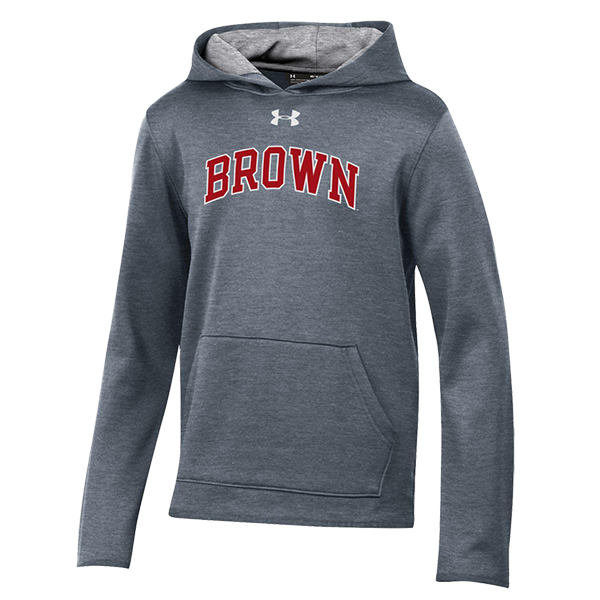 Please select option for Under Armour Girls Armour Fleece Hoodie. Under Armour, 100% polyester. Heathered shirt with grey sleeves and neck. 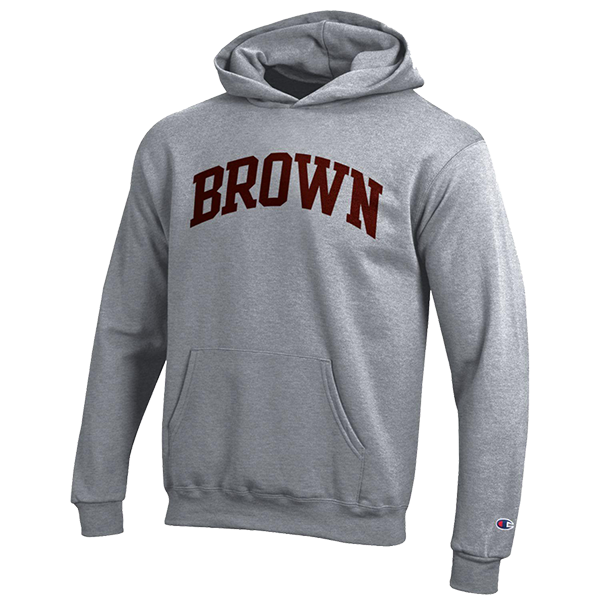 Large UA logo imprinted in white above 'BROWN' in white outlined letters, followed by 'UNIVERSITY' in white lettering. Crest in white, cardinal, black, and gold at center. 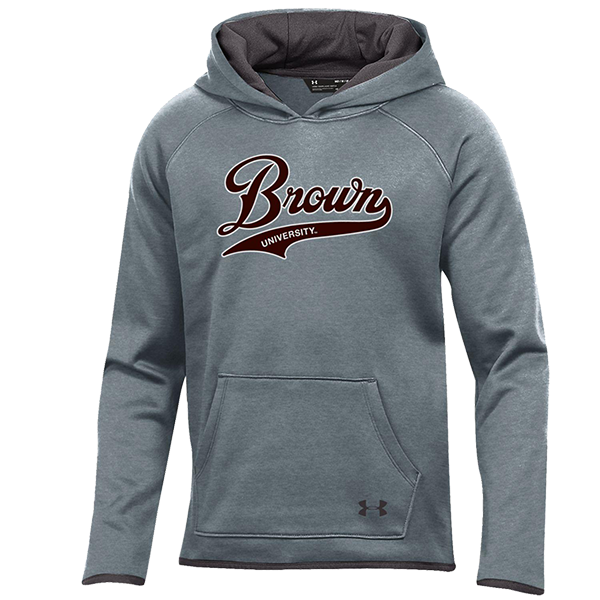 Please select option for Under Armour Heathered Sweatshirt - $68.99. Under Armour, 100% polyester. Loose youth tee in heathered-maroon. 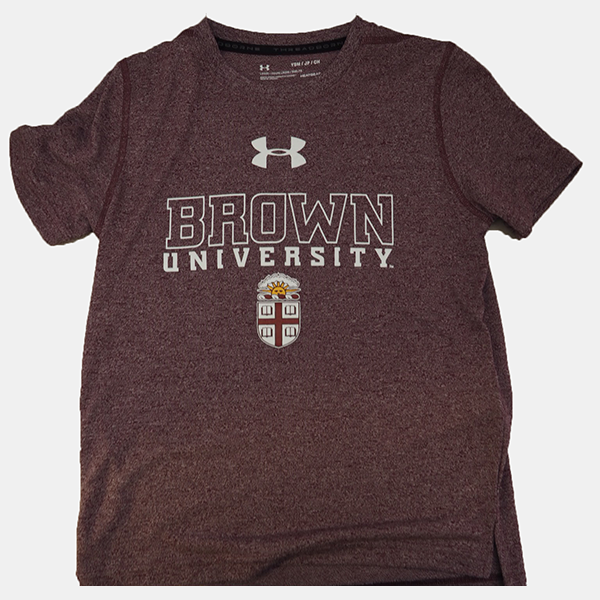 Large UA logo imprinted in white above 'BROWN' in white-outlined letters above 'UNIVERSITY' imprinted in white lettering. Crest in cardinal, white, black, and gold at center. Please select option for Under Armour Youth Threadborne Maroon Tee - $28.99. 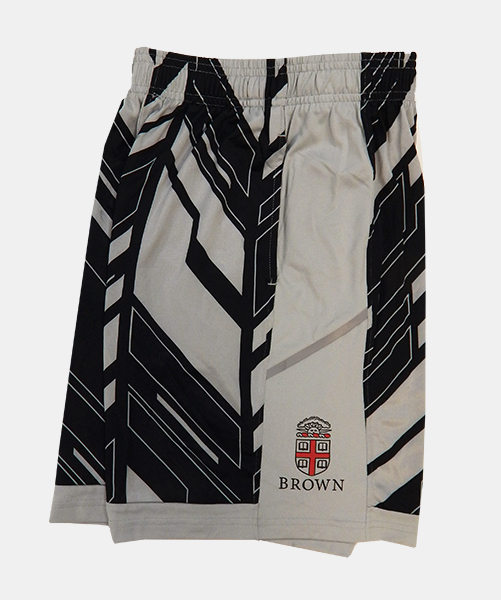 Third Street 100% nylon, elastic-waist brown youth shorts with cardinal and white trim. 'BROWN' imprinted in white outlined letters above '64' imprinted in white outlined letters on lower-left leg. 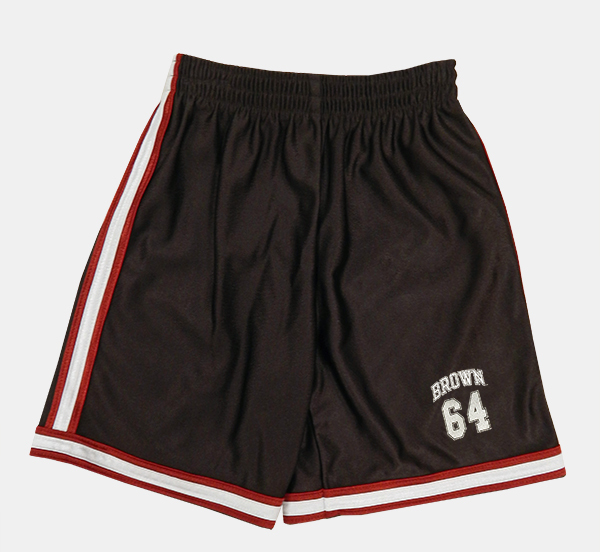 Please select option for YSH - Third Street Youth Brown Stripe Shorts - $29.99. Under Armour heatgear, loose-fit, grey and white graphic shorts with hot pink trim and elastic waistband. UA symbol imprinted in reflective hot pink on lower-right leg and 'BROWN' imprinted in hot pink with white outline on lower-left leg. 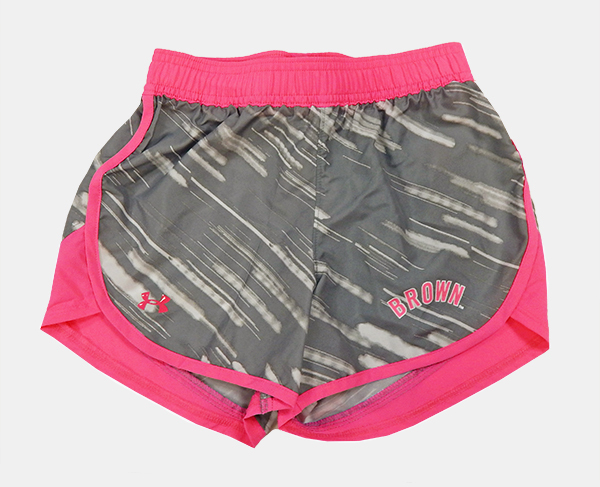 Please select option for YSH - Under Armour Grey & Pink Girl's Shorts - $29.99. Under Armour heatgear, loose-fit, 100% polyester, wide-elastic drawstring waist, black and grey graphic youth shorts with reflective trim on grey side panels and mesh side pockets. UA symbol on right side panel and cardinal and black Crest above 'BROWN' in black on left side panel. Please select option for YSH - Under Armour Youth Black & Grey Crest Shorts - $39.99. 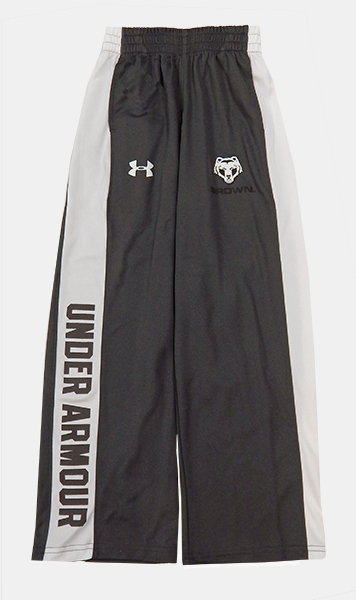 Under Armour allseasongear, loose-fit, 100% polyester, wide-elastic waistband, charcoal and white striped youth mesh sweatpants. UA symbol imprinted in white on upper-right leg, black and white Bear mascot imprinted above 'BROWN' in black on upper-left leg, and 'UNDER ARMOUR' imprinted in dark grey down lower-right side white stripe. Please select option for YSP - UA Youth Charcoal & White Striped Sweatpants - $24.99. 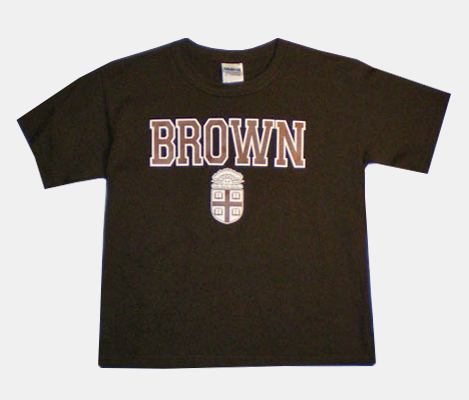 ES Sports dark brown 100% cotton t-shirt with "Brown" in brown lettering with white outline and brown and white crest. 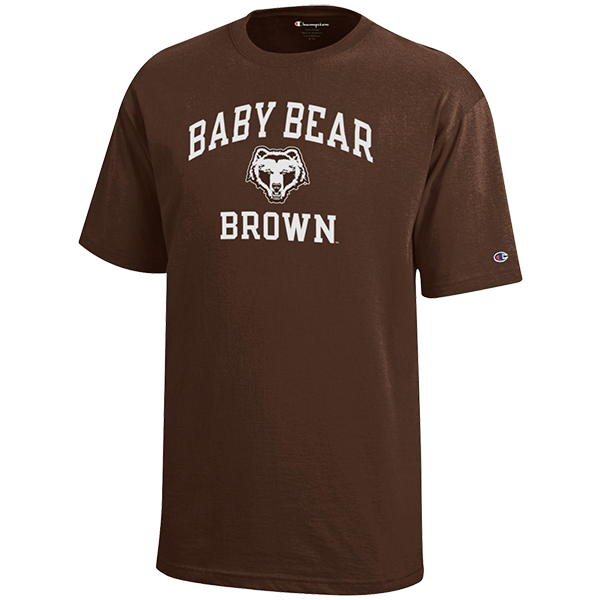 Please select option for YT - ESS Youth Brown Crest Tee - $18.99. 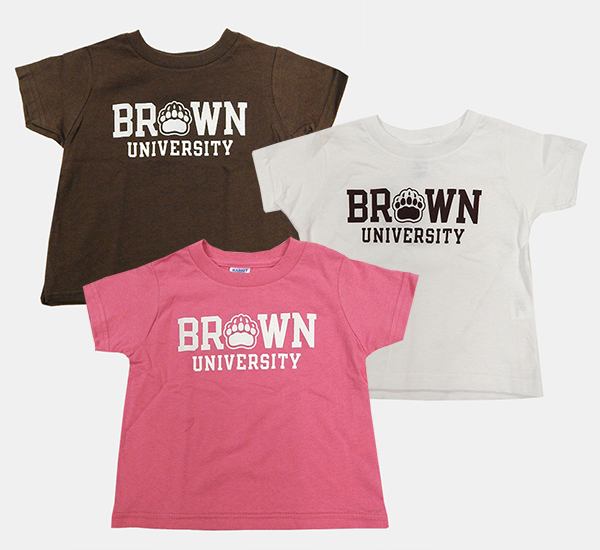 ES Sports 100% cotton short-sleeve youth tee has 'BROWN UNIVERSITY' imprinted with Paw print replacing the 'O' in Brown. Note: Limited quantities of each size; Available in toddler sizes also. Please select option for YT - ESS Youth Paw Tee - $18.99 - Turquoise - $16.99. Under Armour heatgear, loose-fit, 100% polyester, grey tanktop with black inserts. 'Brown' imprinted in black script above black and white Paw surrounded by white stars above 'Bears' in black. 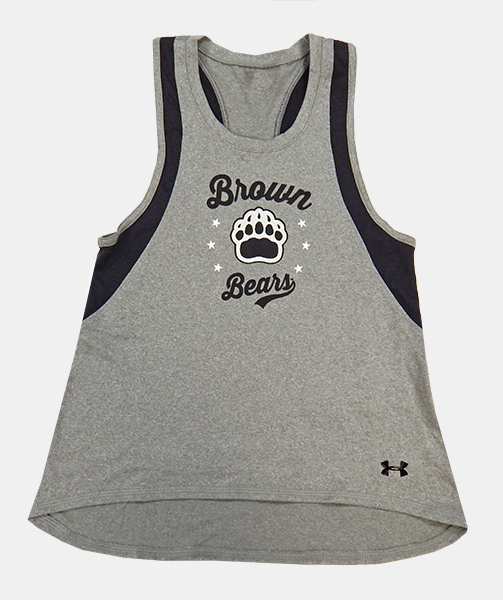 Please select option for YT - Under Armour Girl's Grey & Black Paw Tanktop - $29.99. Under Armour heatgear, loose-fit, 100% polyester, youth tee with black front panel and sleeves, black and grey graphic panel on top front, and black and grey graphic back panel. UA symbol imprinted in white above 'WHO'S GONNA STOP US?' in white above brown and white Bear mascot. 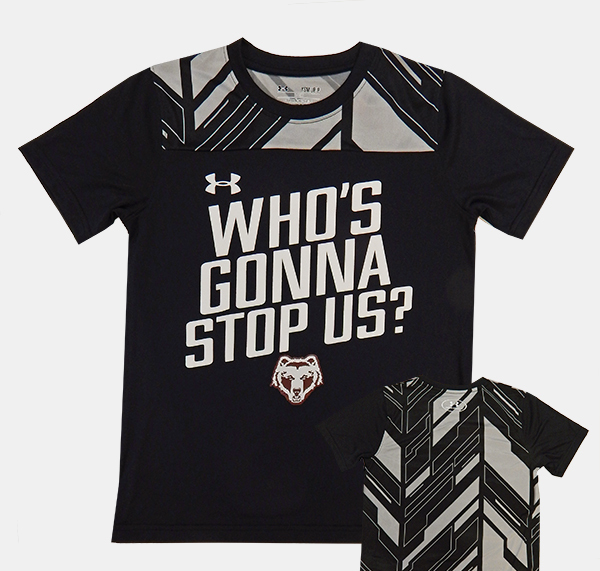 Please select option for YT - Under Armour Youth Black & Grey Bear Tee - $34.99. Under Armour heatgear, loose-fit, 57% cotton, 38% polyester, 5% spandex, brown youth tee with grey panel on upper-back (see inset). 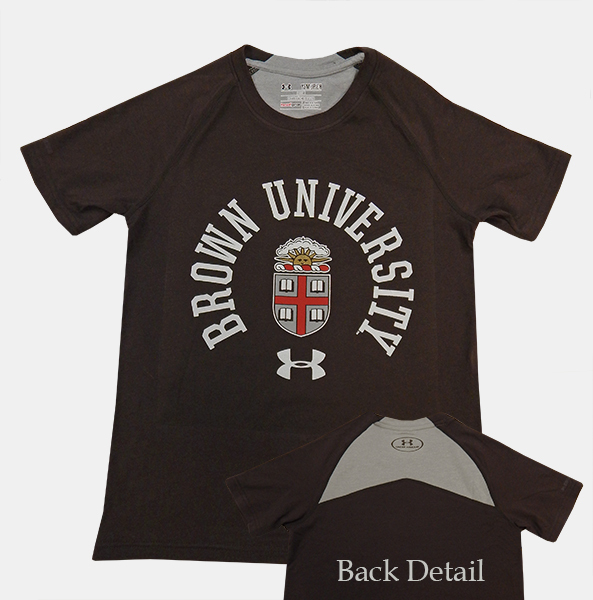 Arched imprint on 'BROWN UNIVERSITY' in white around grey, cardinal, black, white, and gold Crest above Under Armour symbol in white. Please select option for YT - Under Armour Youth Brown Crest Univ. Tee - $33.99.